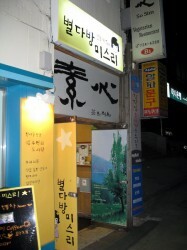 The first vegetarian restaurant we tried was the So Sim Vegetarian Restaurant on Insandong-il. It’s right at the end of the street, close to a 7-11. The restaurant is down the stairs from street level. We were eating a little late, since it took us a while to find our hotel and get sorted. The restaurant had nice ambience, we were in a little booth and had good privacy. This was our first introduction to Korean food – and, well, it wasn’t a very good one. Basically, our take on vegetarian Korean food is that it’s all the kimchi, but without any of the other meat or fish side dishes. And, well, we don’t like kimchi, so, it wasn’t very good. There are many little dishes to choose from, but we only actually liked one of the dishes. However, they were open (unlike some restaurants that were already closed at 9pm) and we didn’t have to worry about having any fish or meat surprises on Wendy’s plate.